After graduating in 2001, Mangum joined acclaimed chef Greg Brainin at the iconic Jean Georges, finding a natural knack for the meat station. Tapped in 2008 to lend his expertise to the launch of a new barbeque concept, Mangum then moved to Pennsylvania to consult on the launch of Smoking Lil’s in Doylestown. 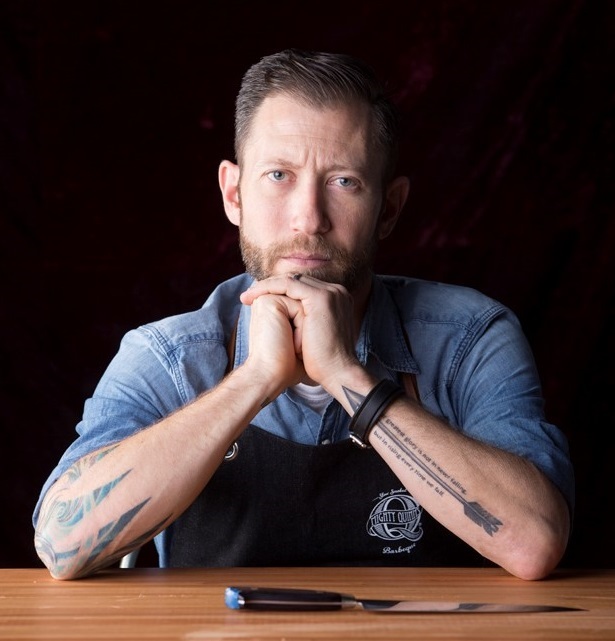 He soon became Smoking Lil’s executive chef and pit master, before moving on to serve as executive chef and chief creative officer for Jules Thin Crust, an innovative pizza chain based in Pennsylvania. All the while, Mangum was smoking meat as a side hustle. In 2011, at the encouragement of his cousin-in-law Adam and wife, Laura, Mangum introduced his slow-smoked creations to Brooklyn’s Smorgasburg food market as Mighty Quinn’s Barbeque. Achieving the longest lines at the market, Mangum recognized Mighty Quinn’s appeal, and opened the brand’s flagship eatery in Manhattan’s East Village in 2012. Mighty Quinn’s now has 15 locations globally, including Dubai, Manila, and Taiwan. In addition to his barbeque prowess, many know Mangum from his appearances on “Cook Like an Iron Chef” with Michael Symon, “Unique Eats,” and “Beat Bobby Flay.” He also is a “Chopped” champion and appeared in the critically acclaimed movie, “Julie & Julia.” Mangum was tapped by the Food Network to be a “Firemaster” in the network’s new series by the same name, which premieres on Food Network Canada this spring. The culinary personality splits his time between NYC and Los Angeles with his wife and three children. An avid racing cyclist, he rides roughly 200 miles per week, and is on the leadership council for the annual ChefsCycle charity ride benefiting No Kid Hungry. He is also a brand ambassador for Giant Bicycles, POC Sports, and SRAM Road. Hugh credits the sport for both its physical and mental benefits.